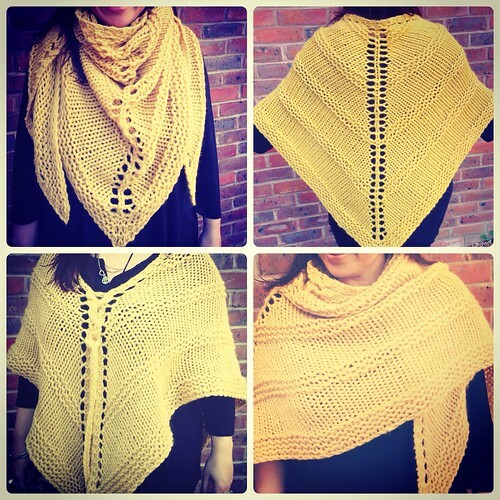 On Friday, my latest knitting pattern went live on Ravelry and Craftsy. Unlike most of my other 'makes' this was one which didn't start out with a clear direction, and it took various incarnations before I had finally decided on exactly how it should look. It knitted up so fast that I made and ripped it out a few times when I couldn't decide from sketches which directions I wanted the eyelets to travel - all in the same direction, symmetrical from the central increases, or alternating. I finally decided on something I thought I might like... until I was ready to move onto the planned (fancy) border. With it layed out flat, it became obvious that while the design was sound, it wasn't really "me". I prefer my knits to be plain and simple... and big. There wouldn't be time to make it before Unravel, so it was put on hold. When I finally picked the yarn back up (with an extra 200g ball), it was with a clear direction - a plain simple triangle which would be enormous, and which could be worn as a shawl or transformed into a poncho - it would be a "ponshawl". 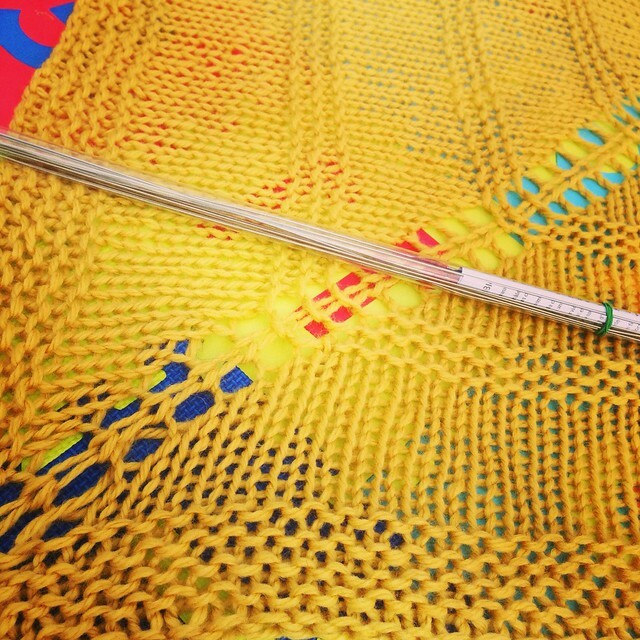 It didn't take very long to knit up all 600g and make the icord using a lucet. It was huge, red and simple - in short, it ticked all my boxes. In fact it worked so well, as soon as I wore it I knew I had to make another one in a wool yarn and with a longer icord (asap!). The acrylic yarn is very warm and dense, and as a rule I prefer natural fibres which are more breathable (but which are also significantly more expensive and higher maintenance). After consultation with a few different knitting friends, I ordered 400g of Rowan Big Wool in the 'Sun' colourway (almost £9 per 100g ball) - perfect for the beginning of spring. Once it arrived, the triangle and icord were finished within just over four hours. Blocking and drying took longer than the knitting, giving me time to reflect... and to spot the obligatory mistake - a forgotten pair of increases smack-bang in the centre of the shawl - grrr! 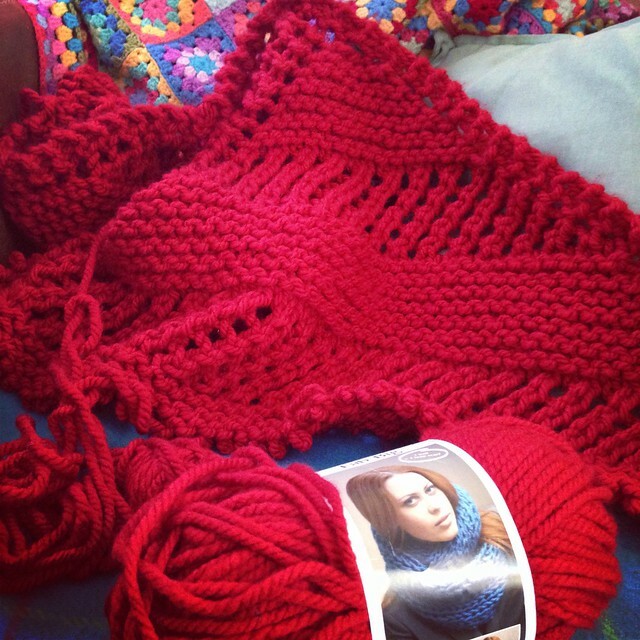 Simple stitches, quick progress and a satisfying result at the end - this would be a perfect project for a new knitter. So I started writing the pattern with beginners in mind. For a knit that took only four hours, the pattern-writing took over a fortnight! It had to be clear enough for a novice to follow, and that also meant photographing new tutorials (for the cast on, making the icord with a lucet and also with DPNs) which are linked in the pattern. With all that done, the lovely test knitters got to work. (One of the testers decided to knit it as a stash-buster project and used 4 strands of DK held together, alternating one strand every few rows for a stunning result) and the pattern was revised, clarified, finished and ready to publish. 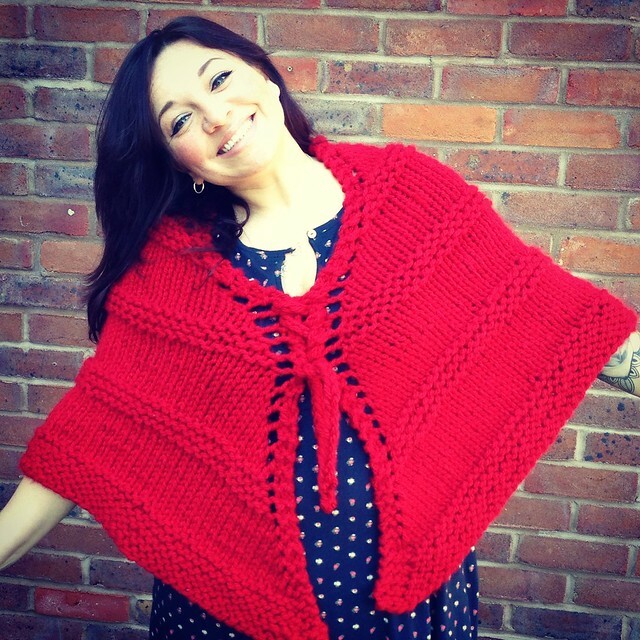 Thanks to everyone who has already downloaded the pattern so far. If you haven't yet, but you'd like to know more, head over to Ravelry or Craftsy where you'll find details of the yarn and notions, and the skills used.